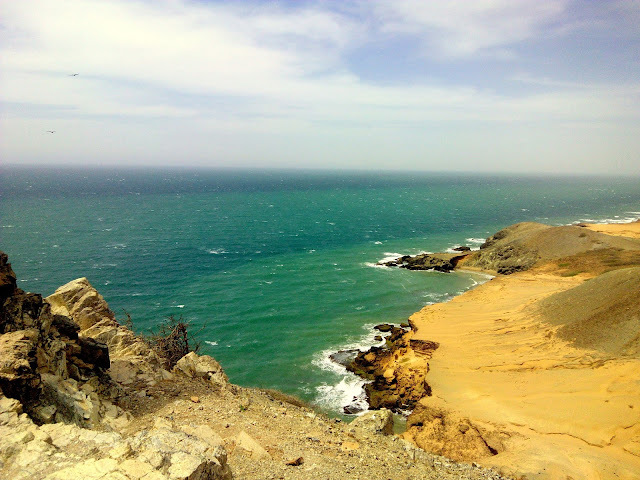 Despite travelling extensively throughout Colombia, there are a few spots that always pull me back. Cartagena, just an hour and a half away from Barranquilla, is certainly one of the places. 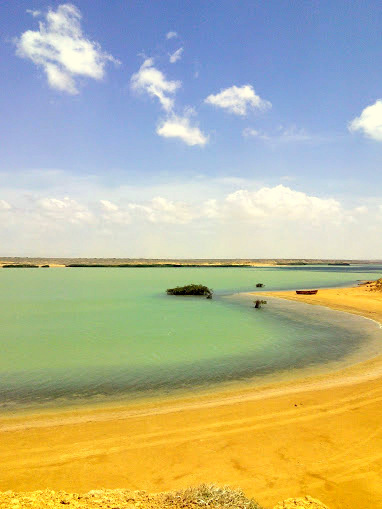 A top tourist destination, its old city is a UNESCO world heritage site and its nearby islands are home to some of the countries most pristine beaches. A friend recently visited from Buenos Aires and when I asked what he wanted to do, the response was clear. “Beach, beach and lots of sun”. Coming to visit me on the Caribbean coast, he was in luck! 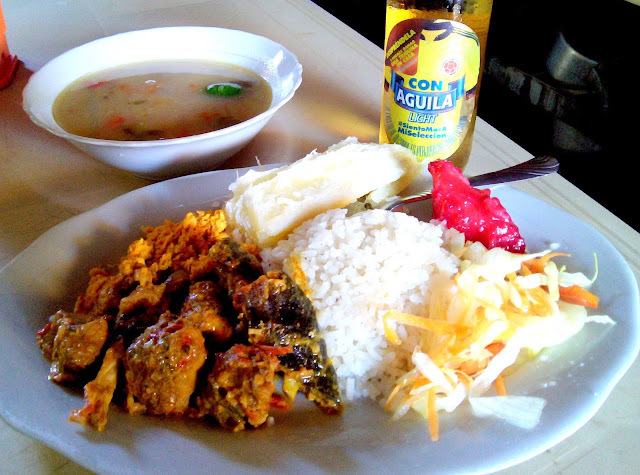 We headed to Cartagena for a few days to soak up some rays and naturally, food held an important part in the holiday. We began our trip by setting off for a nights stay on a group of islands known as the Islas del Rosario, about 45 minutes away from Cartagena by boat. 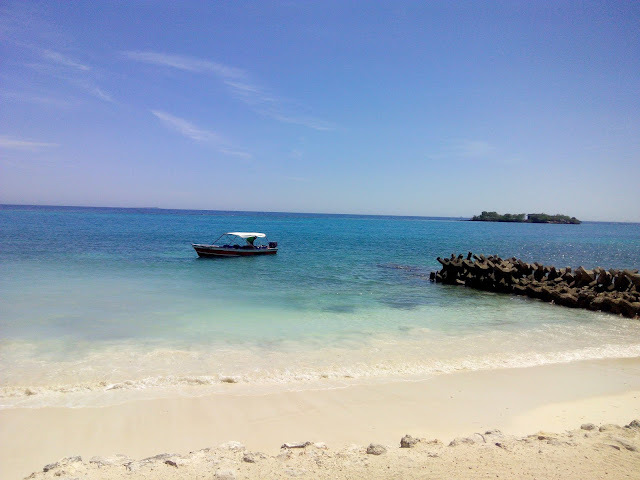 Made up of various small islands, we stayed on Isla Grande and were treated to two days of gorgeous sun and completely unspoiled beaches. The hotel we were staying at had delicious food, however it was rather on the fancy side. 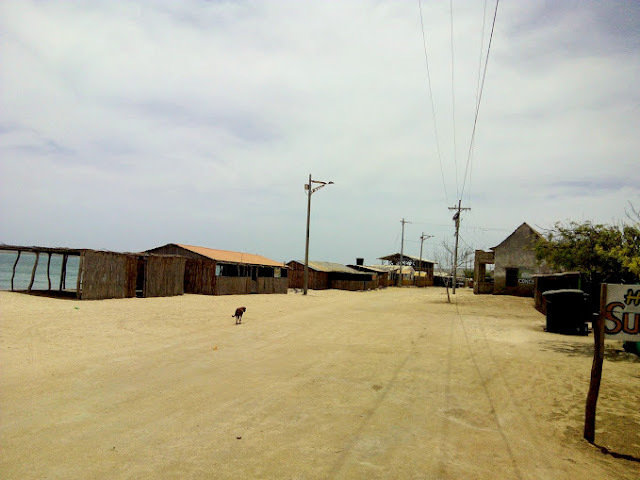 We decided to venture away from the hotel and explore the island, home to around 800 permanent residents. We got chatting to a local fisherman who showed us some very impressive freshly caught lobsters, which soon became our lunch! 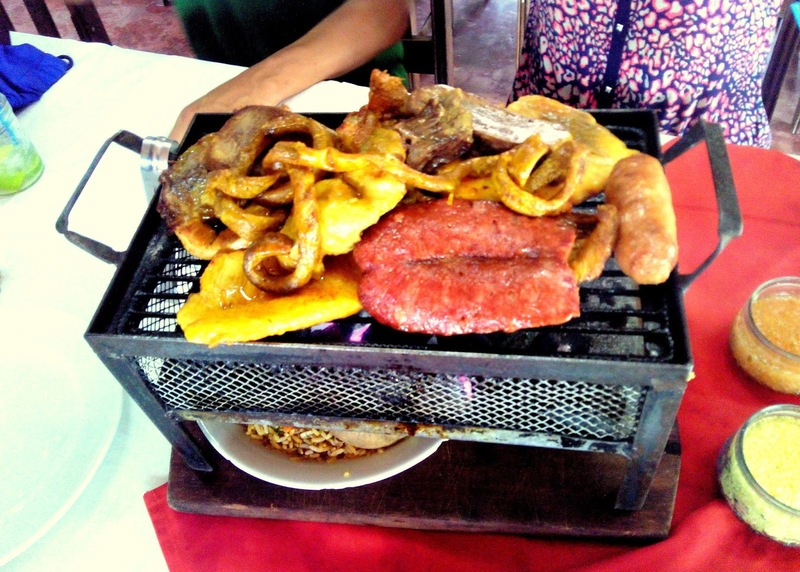 They came cooked al ajillo (in a garlic sauce) and grilled, served with patacones (fried plantain slices). 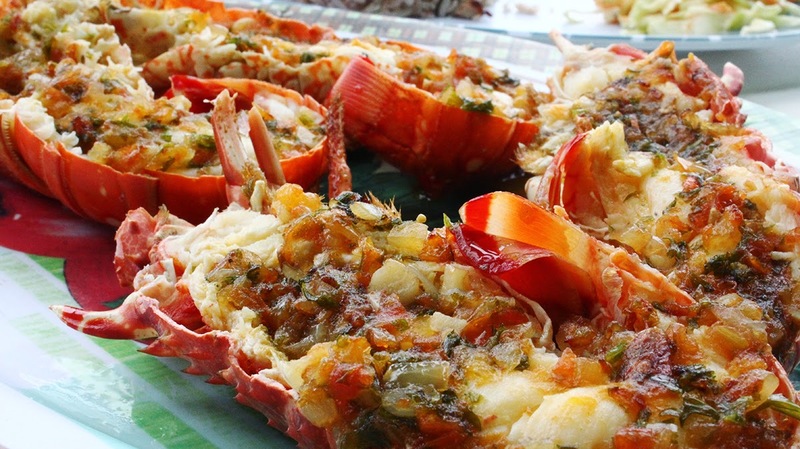 The lobster was flavorsome beyond belief – completely fresh and cooked to perfection. Like many other food-lovers, I hold the chef Anthony Bourdain is extremely high esteem. The author of the Kitchen Confidential, a fascinating insight into the world of restaurants and well worth a read for any foodies, he is also the star of his own show No Reservations, where he travels the world trying typical (and sometimes not so typical) foods in many different countries. The clip above is a section from the No Reservations Colombia episode, and if you skip to 4 minutes in you can see Bourdain at Cartagena’s very own Bazurto Market. Be warned – Bazurto is no trendy pop-up style food market. 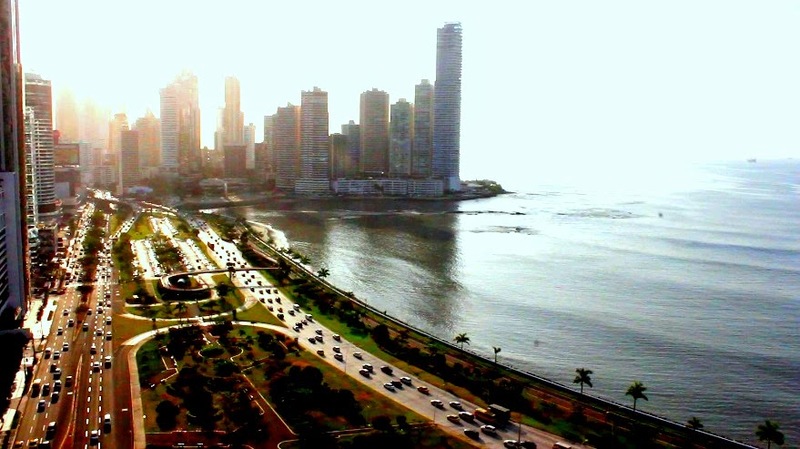 It’s a chaotic, dirty, loud and rather smelly place, but if you want to see the real Cartagena, this is where to come. I previously visited with my sister and enjoyed it so much I decided to head back with my friend. Although he seemed slightly overwhelmed by it all (seeing a chicken being boiled while a van full of soldiers with machine guns rocked up was perhaps slightly unsettling), we headed off in search of the famous Cecilia’s, as featured in Bourdain’s No Reservations episode. 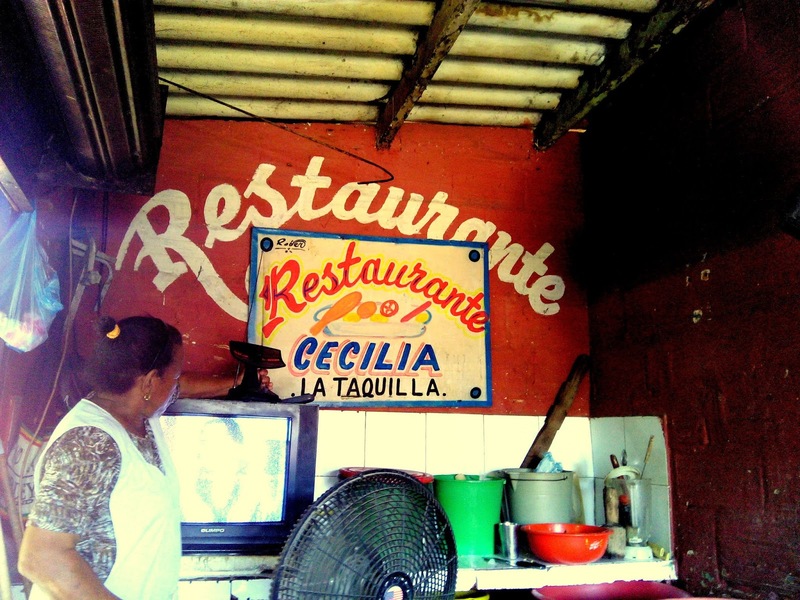 When I had visited previously, Cecilia’s famous turtle wasn’t an option, but returning I was spoiled for choice – fried, stewed or grilled, turtle seemed to be the top meal of the day. In his No Reservations episode, Bourdain himself states that turtle is endangered, but that its consumption has been part of the indigenous culture for hundreds of years. Upon reflection, although this was completely delicious, with a dark, rich flesh and a perfectly seasoned coconut vegetable sauce, eating an endangered species should never be condoned. Even if locals around me were choosing it, as a foreigner I shouldn’t be encouraging this practice. 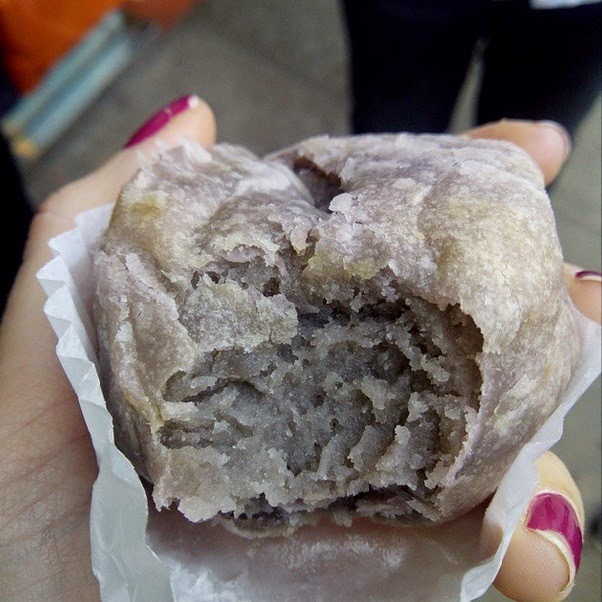 As a unique experience, it was definitely interesting to try this local dish, even if I will not be doing so again (I promise!). After the sights and smells of Bazurto market, it was back to the beach for another day of relaxation before we headed across the coast to Santa Marta, another one of my regular haunts. It’s a tough job all this travelling and gastronomical exploration, but I guess someone has to do it. 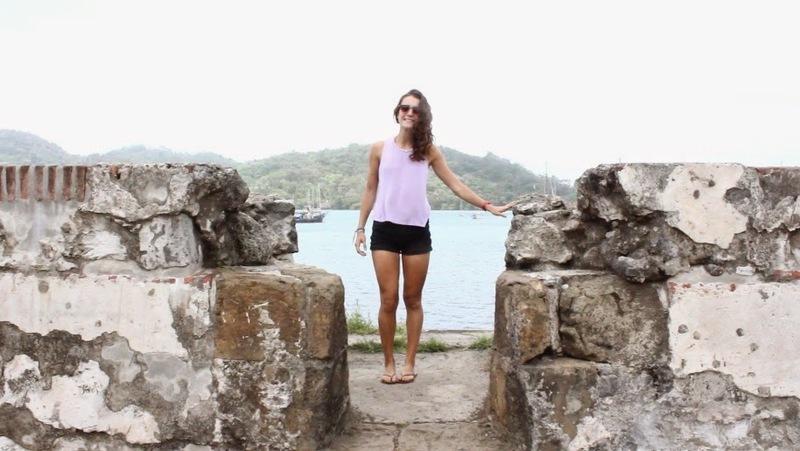 Stay tuned for another travel post which sees me return to perhaps my favorite spot in all of Colombia, its salsa capital Cali. Unbelievably, nearly a year has gone by since I arrived in Colombia to work as an English Language assistant. 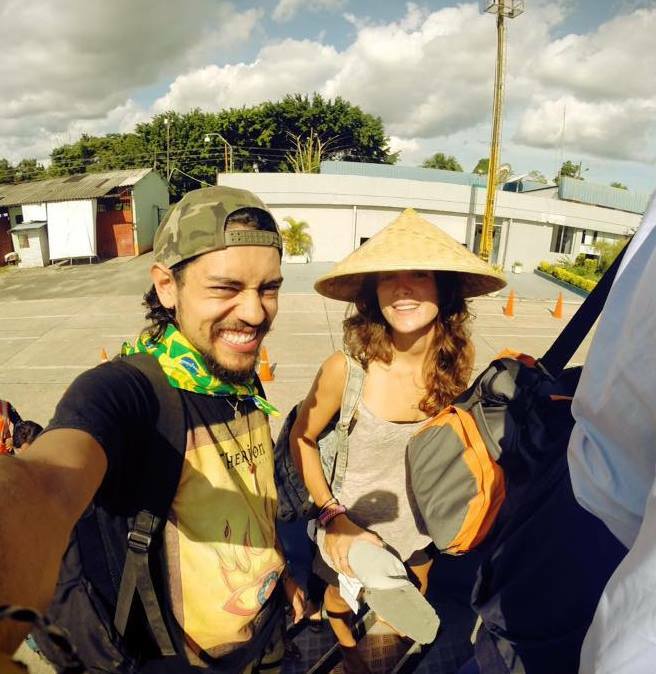 In a bid to see as much of this wonderful country as I can before I head back to blighty, I headed off travelling again, starting in the capital of Colombia’s Amazon, Leticia. 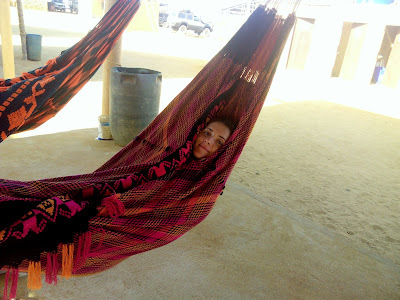 An impressive 800km away from the nearest highway, Leticia is unlike any other part of the country I have visited so far and its borders with both Peru and Brasil make for a real melting pot of cultures. Coming in on the plane from Bogota, all that can be seen for hundreds of miles is thick, dense jungle forest. Travelling alone, I reached the hostel I had reserved and got chatting with two girls in my dorm, both from the UK. It was around lunchtime and our tummies were rumbling, so we headed off in search of some grub. 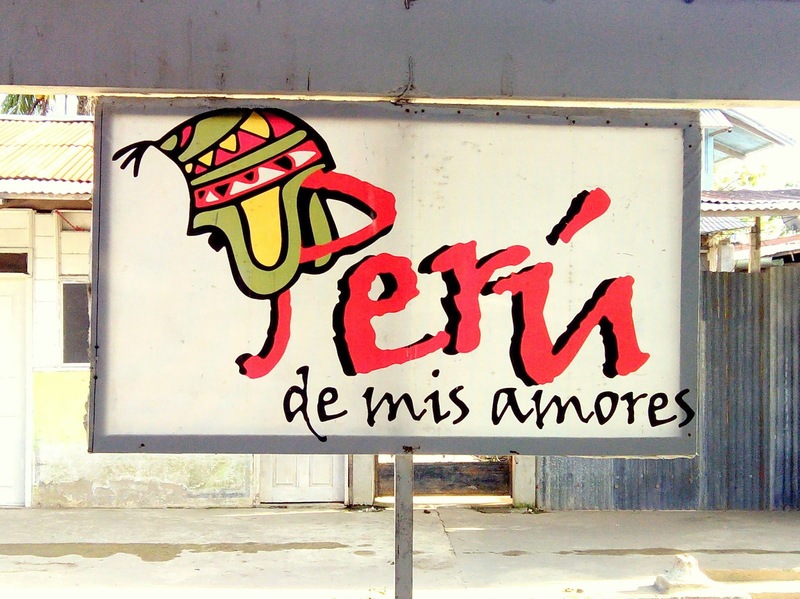 Leticia holds many exciting culinary options, but perhaps the most exciting is the fact you can nip into Peru for some fresh ceviche, or head on over to Brasil for their typical brasilero barbecue. 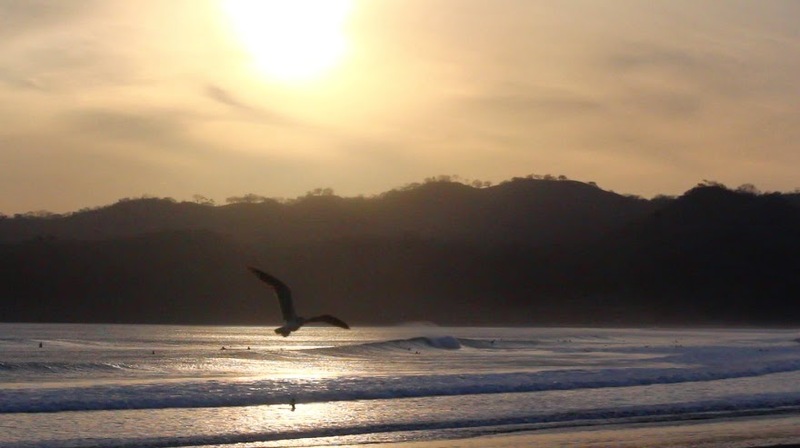 Feeling like something fresh, we jumped in a boat over to Peru, heading for what is known to be the best ceviche in town. Why not arrive to all your lunches via boat? 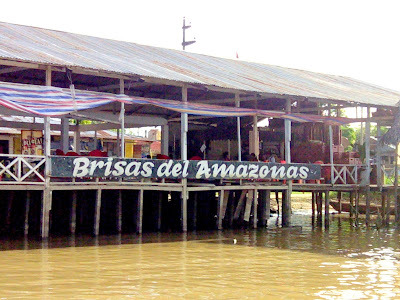 Pulling up to Brisas del Amazonas, the Peruvian music, signs welcoming us to Peru, along with piles of fresh ceviche made it clear we had reached the right place. 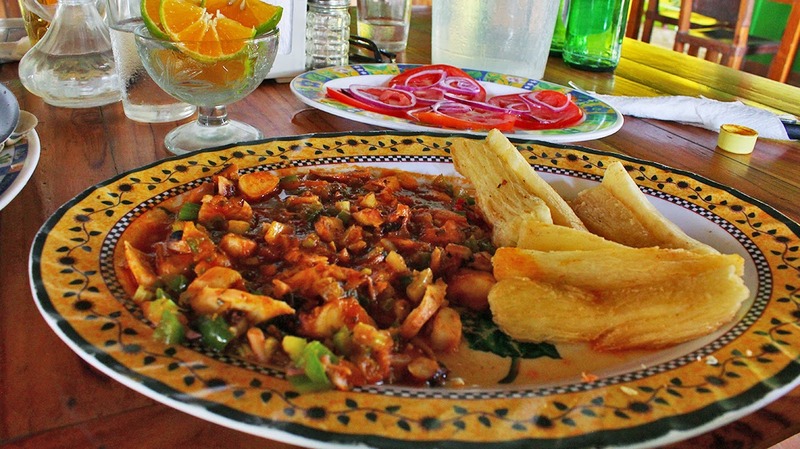 We ordered the mixed ceviche to share, and it was incredible. It came with mussels, prawns, langostines, fresh crab, white fish (which I must confess I do not know the name of), yucca, sweet potato and delicious salty toasted corn. This between three was perfect, and cost a grand total of eight pounds. Luxury meal, budget price = happy lunch out in Peru. Always one to try a local delicacy no matter how weird it may be, Leticia presented me with a first – crunchy, salty, insects. Known as mojojoy, these little bugs were actually pretty tasty. 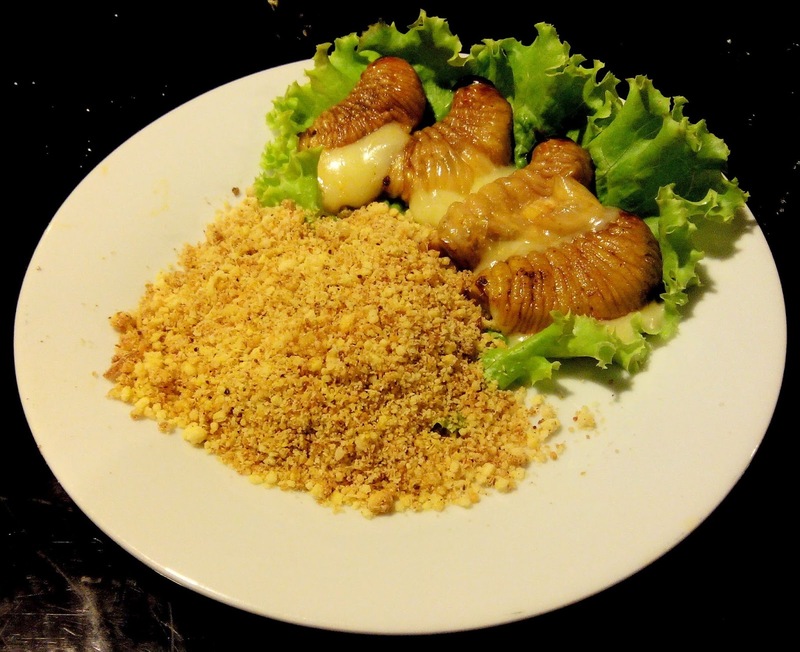 Filled with cheese and served alongside farinha (tasty ground up dried yucca with a nutty flavor), these went down a treat. 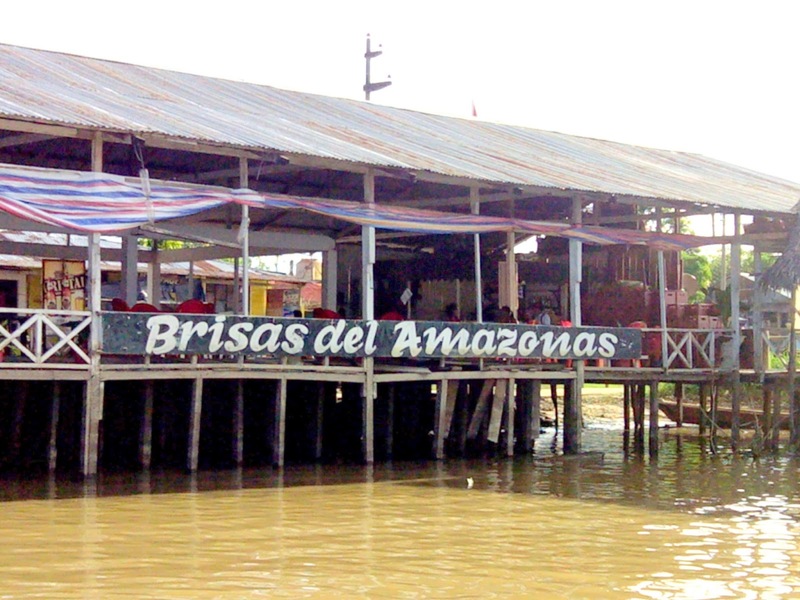 During my stay in the Amazons, I opted for a two-day jungle tour. Alongside 9 other travelers I trekked into the jungle, staying a night in a maloca (the home of an indigenous tribe) and one night under a cambuche (a makeshift shelther) in the middle of the jungle. 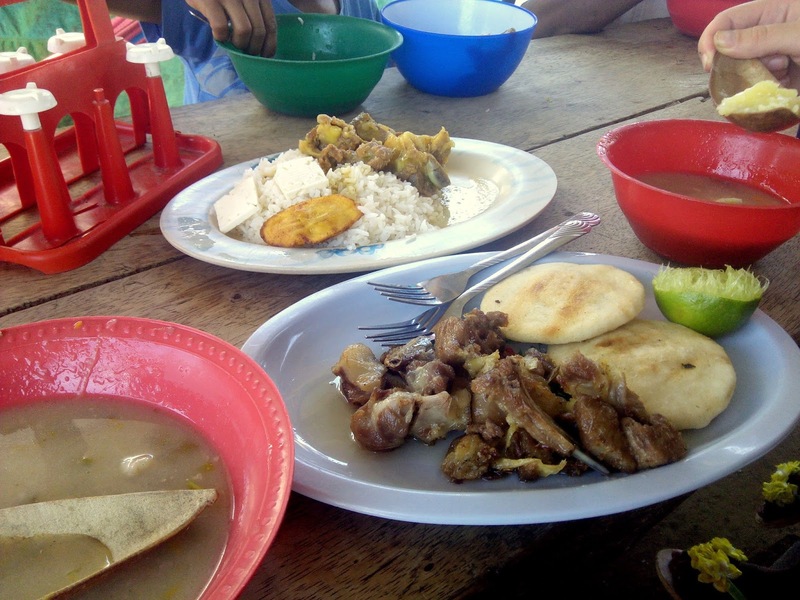 A physically demanding couple of days, it was well worth the torrential rain, tropical heat and hours of walking – if not just for the food alone! 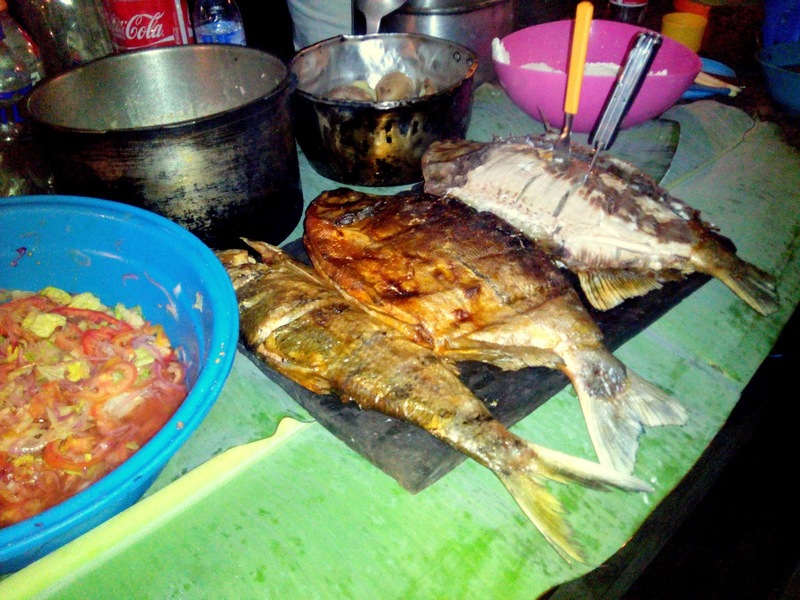 This was no mediocre campside comida – we had some fine meals, featuring whole roasted chickens and enormous fish dinners. I did not imagine the food to be nearly as good as it was and we were all delighted! The meal above features two typical fishes found in the Amazon – the larger two are gamitana, which had a meatier flesh akin to tuna, while the slimmer fish is tucanaré, which was more similar to cod. This all came served with boiled potatoes, rice, salad and a typical cassava pancake with an almost rubber-like texture. While the pancake itself was quite bland, eaten with the fish and salad it was a perfect accompaniment. 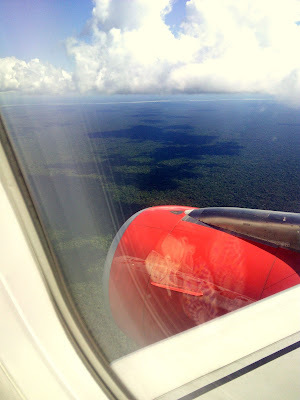 Back from the jungle it was nearly time to leave lovely Leticia, but not before I hopped on over to Brasil. Leticica borders Tabatinga, which is part of Brasil. 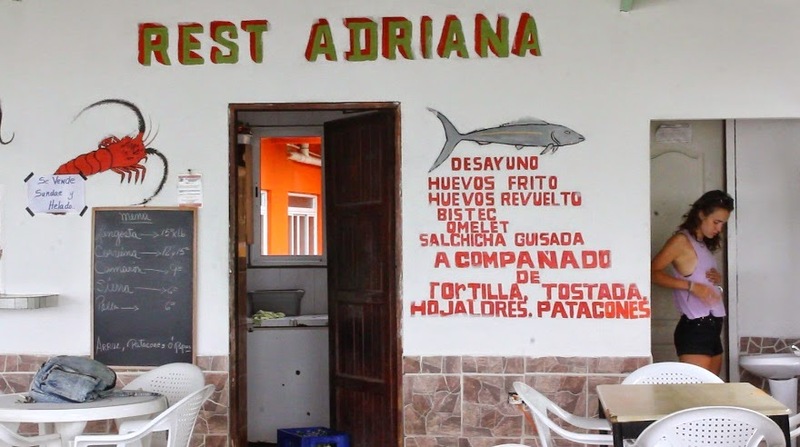 As a town itself Tabitinga hasn’t got very much to offer, other than very cheap cachaça and the well-known restaurant Tres Fronteras, which as the name suggests, offers food from each bordering country. I was fortunately in the company of some very like minded carnivores and we went for the mixed parillada (meat grill). Supposedly feeding two people, this came with chorizo, tripe, chicken breast and thigh, flank steak, tongue and probably about a million other meats I’ve forgotten to mention. As a side, you get a whole plate of arroz chaufa (Chinese style rice) and boiled potatoes. 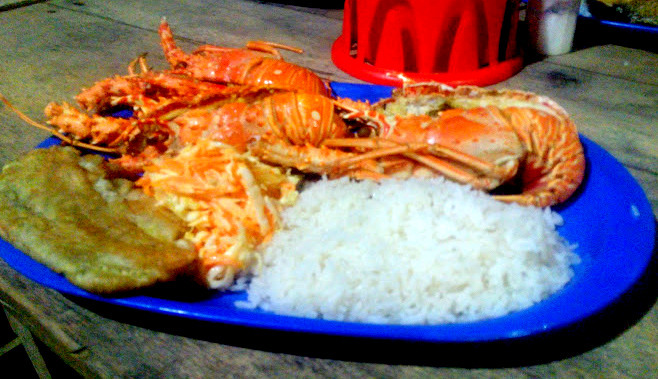 I sincerely want to meet the couple that defeat this alone…between three we still couldn’t finish it! Two weeks have passed since my return from the New York, and here comes the sixth (!) and final post from what really was an unforgettable trip. 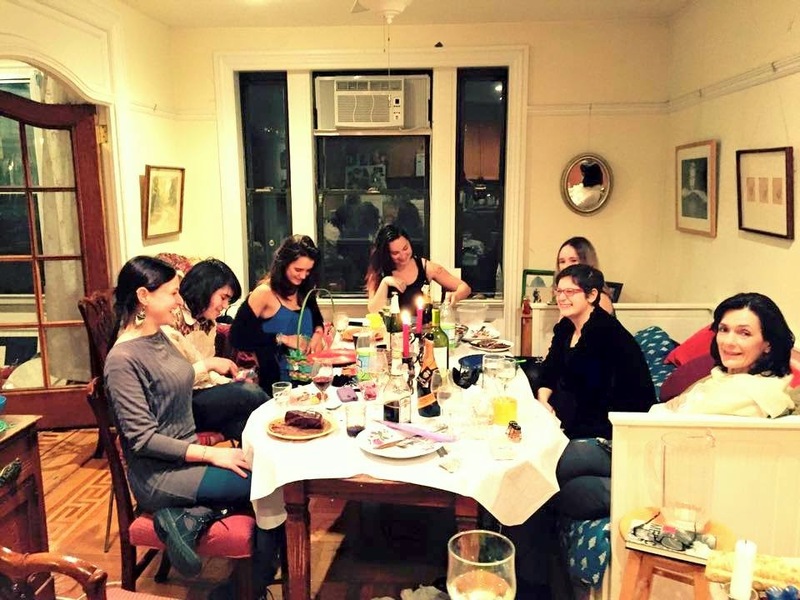 For our last supper in the city, we painted the town red in a very unexpected way – with a non-traditional Passover dinner at our friends house, with lots of wine, a bit of vodka and plenty of history and culture. Seeing the table all set, I got very excited for the dinner ahead. Turns out there was quite a wait before the meal, as we first needed to read the Haggadah, a text that retells the story of the Jewish liberation from Egypt. The Litwaks used an alternative Haggadah, which was compiled by the youngest daughter Sophie. 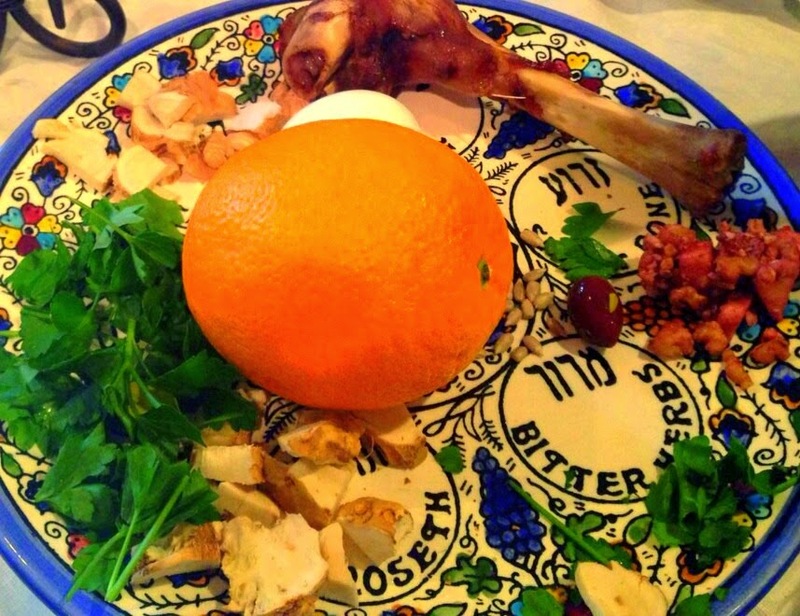 The alternative text we were reading explained why our Seder Plate, which traditionally has 6 items on it (each representing a different part of the story of Passover) had two extra items: an orange and some olives. The orange represented the desire for a non-discriminative Jewish community which includes and welcomes women, queer and transgender people with open arms. The olives held their significance in representing the oppression of the Palestinians in Israel. Sadly the destruction of Palestinian olive trees by the Israeli army is just one way that Palestinians are suffering due to the current conflict. Adding in these two items highlighted the similarities between the liberation of the Jews from Egypt thousands of years ago and issues we are facing today. It was a great point for discussion and reflection – debates did spark up! But all in good spirit and it was a hugely enjoyable part of the night. Although there was still a while to go until the main meal was served, soon came time for a snack in the form of the charoset. This apple and walnut mixture made with red wine and honey represents the mortar that the Israelites used to make bricks while they were slaves in Egypt. 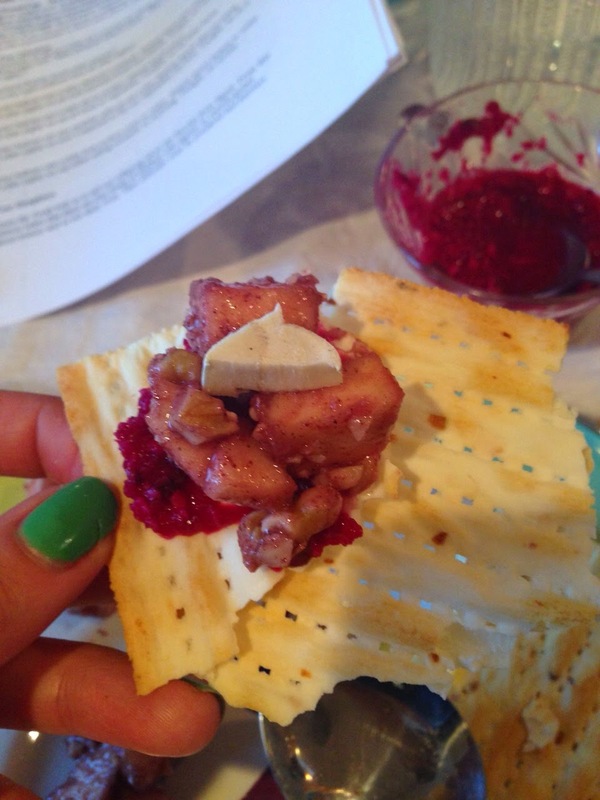 I was told to put it on my matzah bread with some fresh horseradish – a seemingly odd combination, but actually the contrast of flavors was quite delicious. Before the dinner, my mother, a Jew who spent some of her childhood in Israel, told me that I had to try the gefilte fish. When someone tells you something is a ‘must try’, it’s either totally delicious or a bit weird. I can confirm this odd fish formation falls into the latter category. 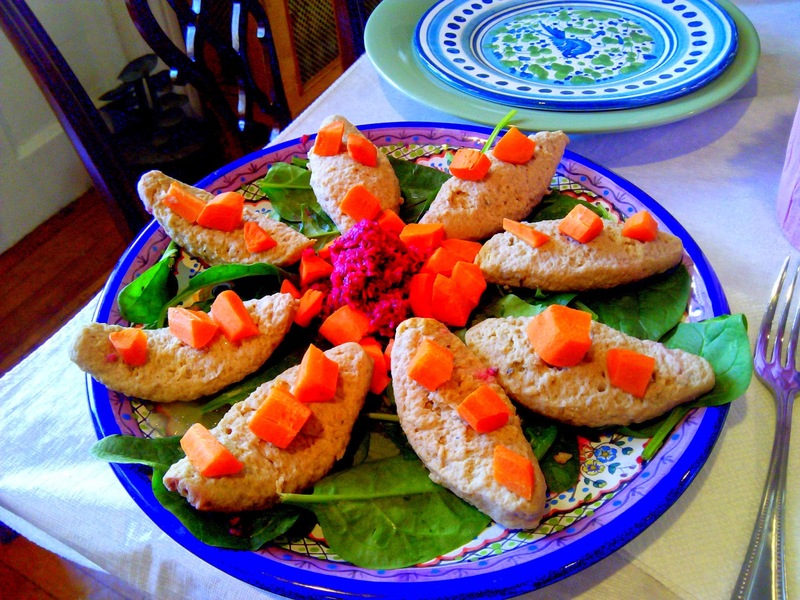 Gefilte fish is ground fish mixed with various other ingredients such onions, carrots, eggs, and seasonings. The delights of this Jewish delicacy were a little lost on me – the strong fish flavors and almost pulp-like texture of it all didn’t really go down well. Skipping past this odd tasting fish dish, and finally it was time to eat! 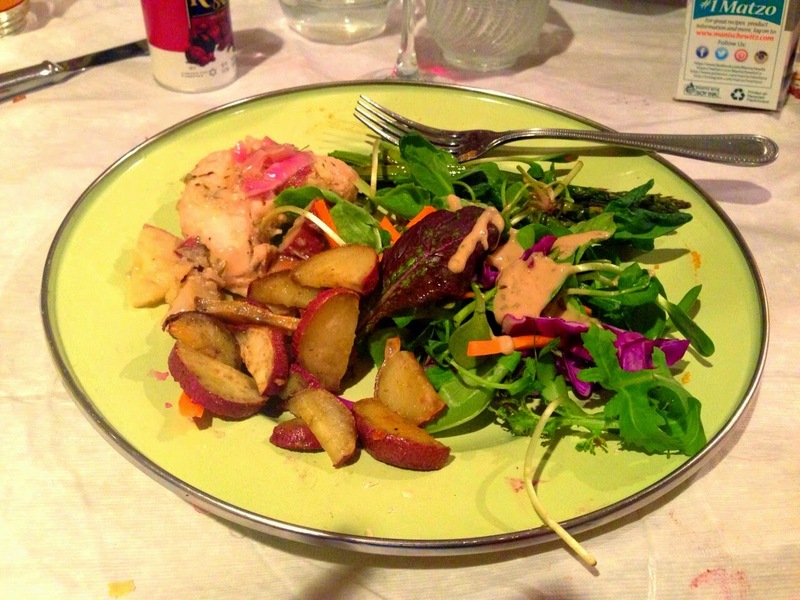 Our meal was served: a delicious roast chicken dinner, with herby roasted veg and fresh leafy salads. Lastly, it was onto dessert. As the Passover story goes, the Israelites left Egypt so quickly that their bread did not have time to rise. It is from this story that the rule of only eating unleavened food (food without wheat ) during the eight-day long Passover period originates. 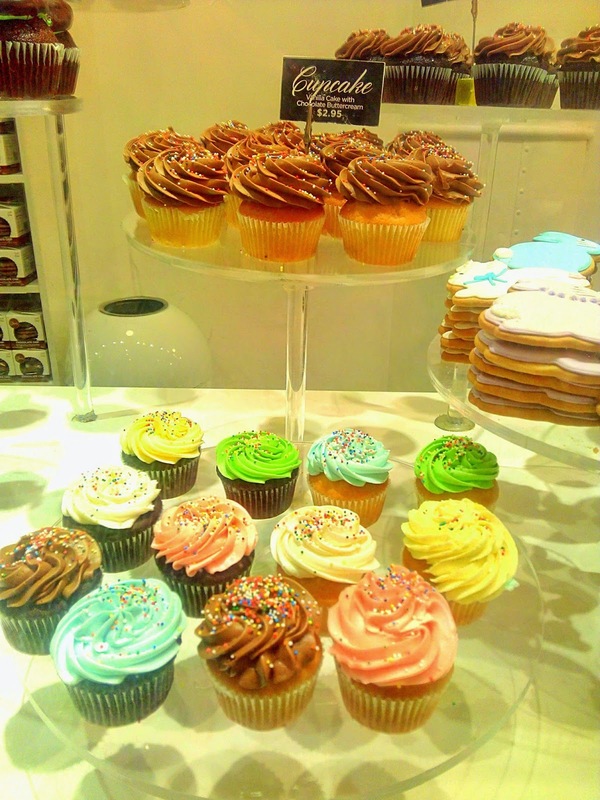 No leavened goods also mean farewell to flour and baking powder – essentials in tasty sweet treats. Does this mean we just skip dessert? Of course not! 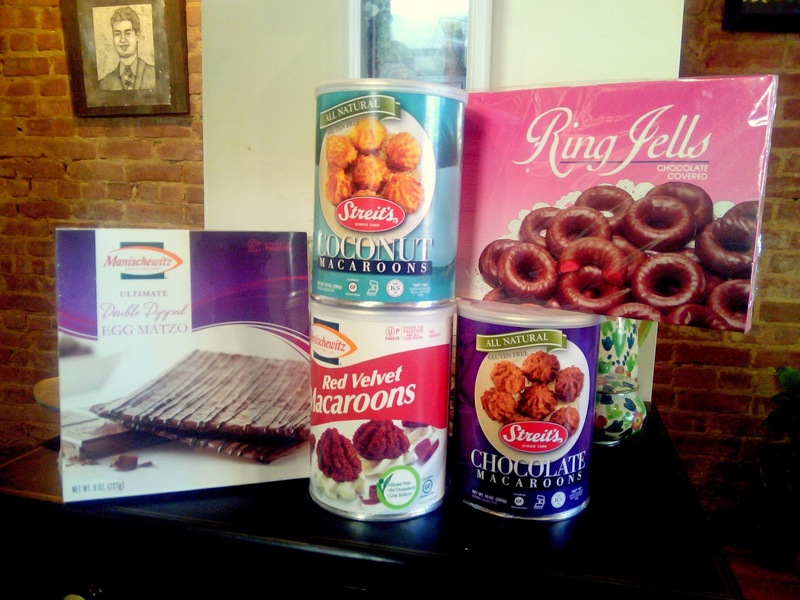 Macaroons made with ground almonds and coconut are a popular sweet nibble, along with chocolate covered matzo bread and some apparently much-loved chocolate covered jelly rings. These gluten-free goodies, along with a rich chocolate tart, were all part of our dessert, making me think there could be something to this lack of leavened goods after all. While we were all curious to try the macaroons, jelly rings (a no-no) and chocolate covered matza bread (surprisingly very good), the star of the dessert was a flourless chocolate cake, bought at the epic Whole Foods Market. This was accompanied by some of NYC’s finest ice cream, bought at Talenti gelato e sorbetto. 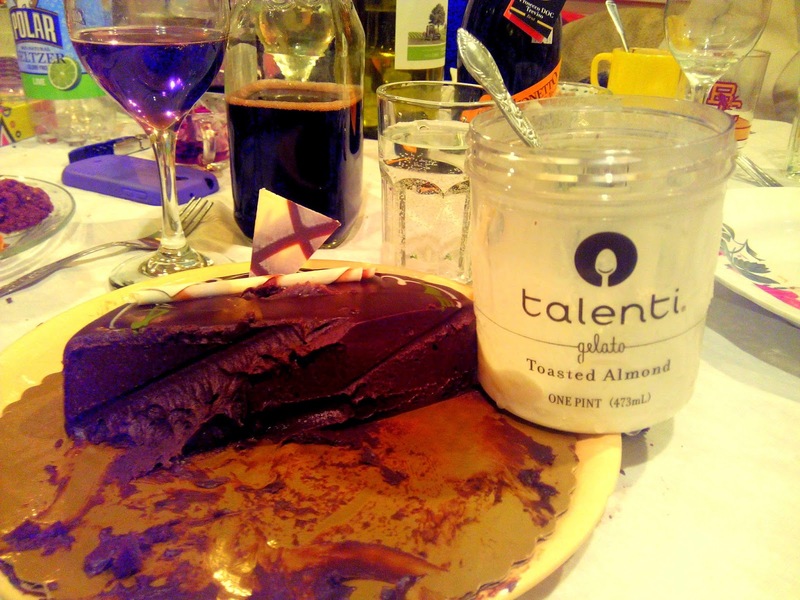 I can vouch for this being some seriously good gelato, and we were able to sample the toasted almond and also black cherry flavor – the perfect creamy compliments for the dense, rich chocolate cake. 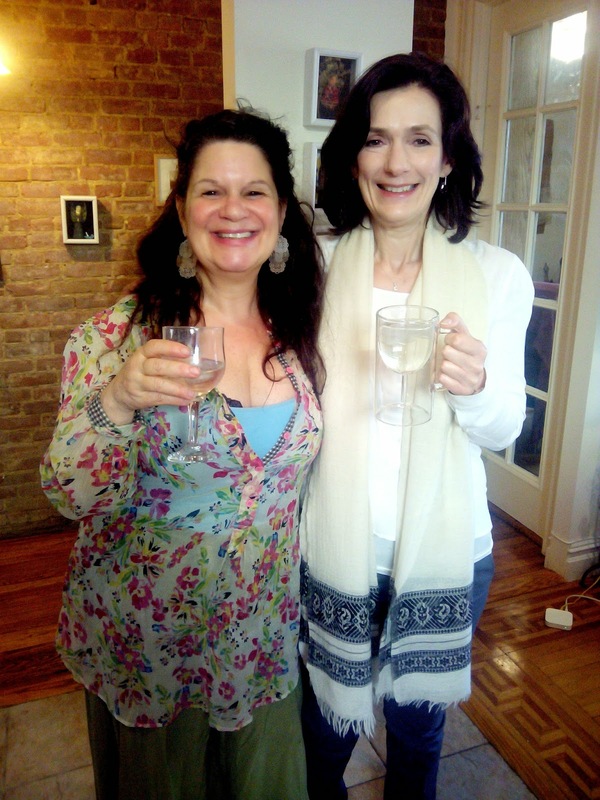 We left the Litwaks filled with food, wine, and memories of a great evening shared with some incredible women. While I previously had never really felt any affiliation to my Jewish blood, after my first Passover dinner I started to have a sense of connection to all the history and stories I had heard. You might not catch me headed down to Hebrew school anytime soon, but this experience definitely sparked an interest into Jewish culture for me. Sadly the next day it was goodbye to the Big Apple, but not so terrible as I was headed back to the sunny Barranquilla and my beloved Colombian coast. As my leaving date is now in sight, I am determined to try all the local delicacies before I leave. 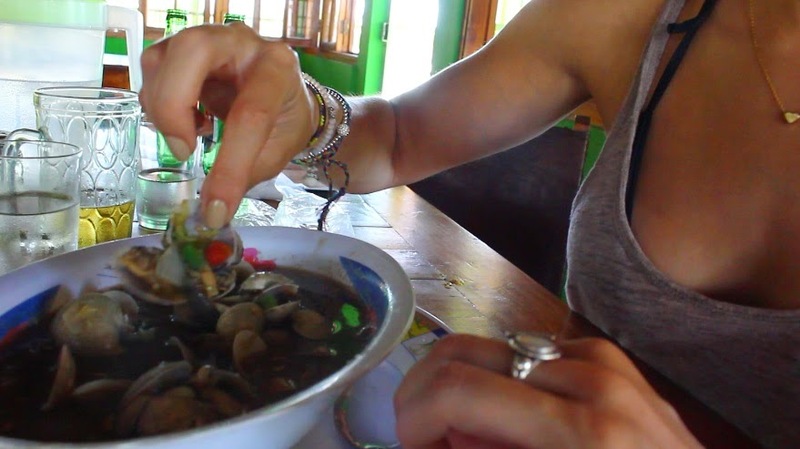 Cow eye soup is next, so stay posted for that typical treat! Jewish Deli food is a serious must for anyone staying in the Big Apple. Chicken noodle soup, creamy chopped liver and sky-high pastrami sandwiches are all typical dishes in these much-loved NYC institutions, perfect for a quick bite during the day or a sobering snack at the end of a long night out. 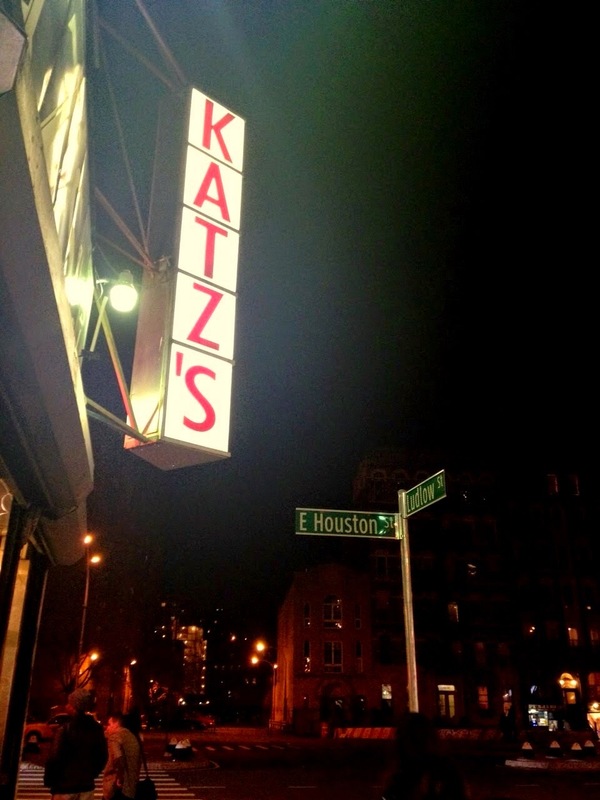 Katz Deli, year upon year, tops lists as the number one deli in New York. 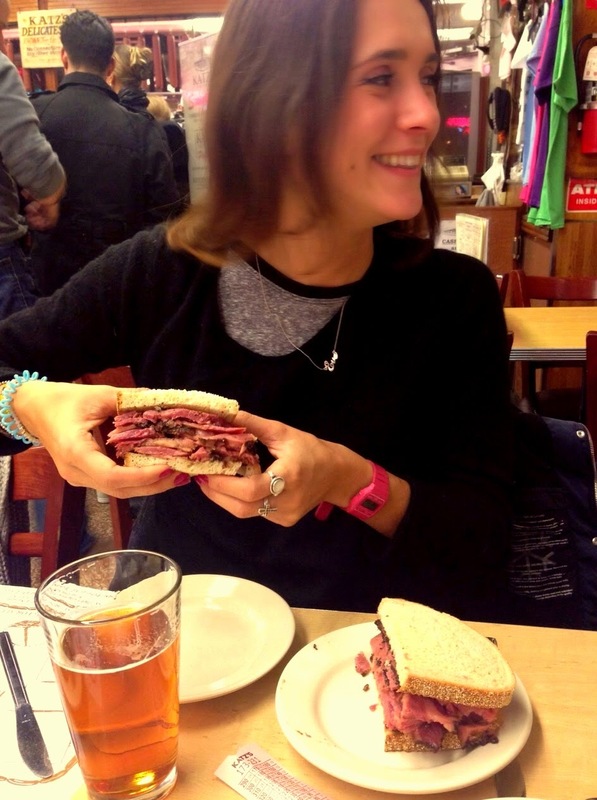 Their pastrami sandwiches draw in locals and tourists the world over, who come in the hope of leaving as pleased as Sally was in the famous scene from the well-known and loved rom-com, When Harry Met Sally. While I refrained from reenacting the scene, it was fair to say my pastrami sandwich was orgasmic. Flavorsome, soft rye bread encapsulates the two-to-four week cured beef, which is salty, soft and filled with flavor. The beef used to make these serious sandwiches has been cured, rubbed, smoked, boiled, and lastly steamed for ultimate flavor and texture. The results of this laborious process? Some absolutely beautiful meat, covered in a peppery skin with a melt-in-your-mouth softness for texture. The selection of pickles which come along with your sandwich add a great vinegary tang to each bite, and with a touch of mustard I’d say this sandwich reaches its peak of perfection. 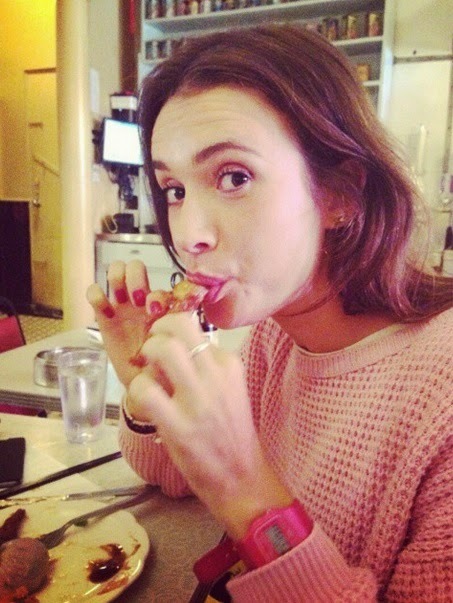 Despite the gigantic portion of pastrami I had just confronted, I was eager to try out some of the desserts on offer. New York cheesecake was a no-brainer, but I was left curious about a ‘noodle pudding’, also know as a kugel or lokshen pudding. My mum told me it was a traditional Jewish dessert made up of cooked pasta, and that she had only ever know herself and her own mum to be fans. Given that it got the thumbs up from none other than mama and grandma Bidmead, I felt it was only right to give it a go, despite how weird it sounded. The noodle pudding was pretty much as described – thick, pasta-like noodles cooked and compacted together, mixed in with raisins and baked. Obviously that isn’t all there is to this dish, and the addition of tasty and health-giving things such as cream and butter resulted in what turned out to be quite a tasty dessert. Perhaps I wouldn’t jump to order it again, and may potentially prefer to keep my pasta as part of my main, but I did actually enjoy it. As for the cheesecake…it didn’t stay around long. With practically no biscuit base, it was a slice of pure, unadulterated cream cheese delight. 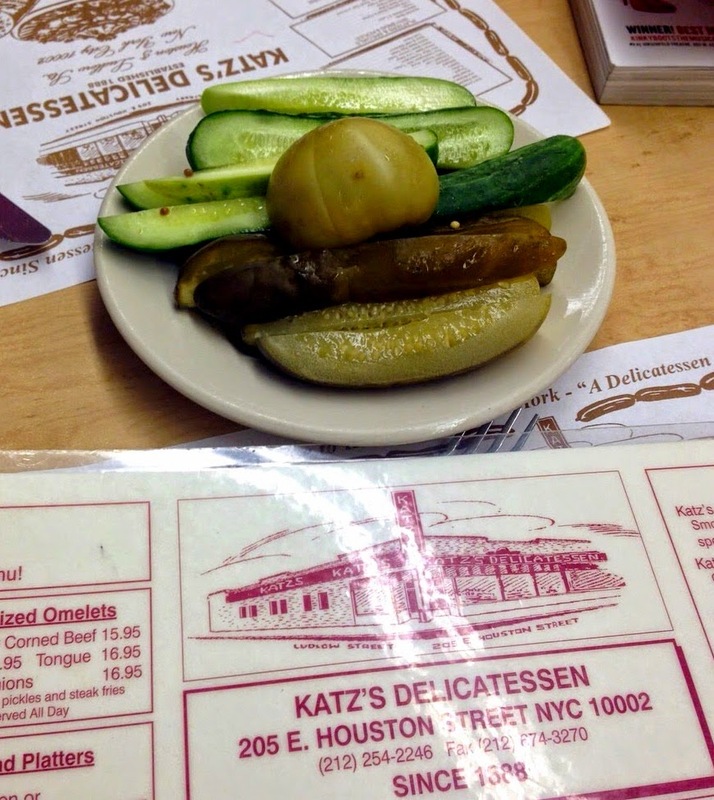 Katz Deli was as much a cultural activity as visiting a New York city museum or gallery. From the packed out dining room to the chaotic ticket system used to pay the bill to the cashier out front, it felt like we were seeing some real New York City action. Who cares if it’s mainly filled with foreign tourists staring hopelessly at their 7-inch sandwiches and the fact that the process of getting served is a bit chaotic? 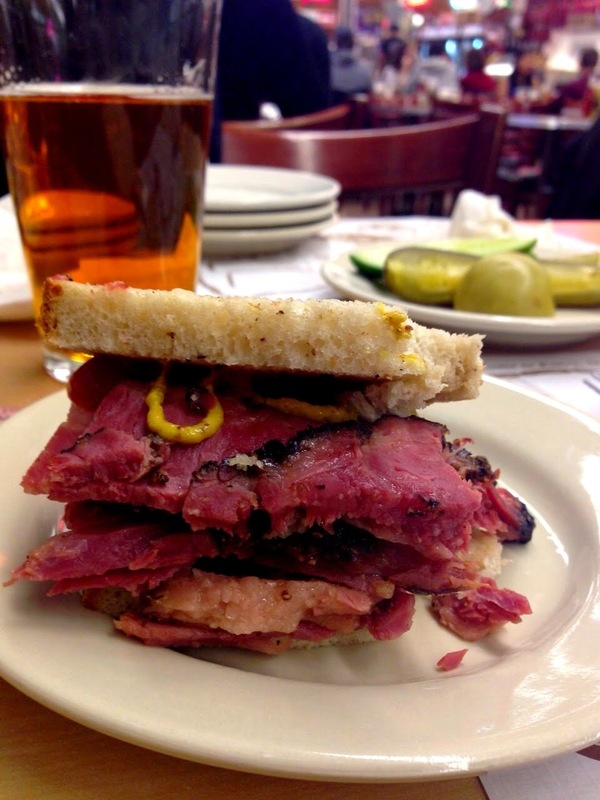 Sit down, roll up your sleeves, and have what she had in New York City’s number one deli. A short subway ride from Manhattan, Williamsburg is the hipster hub of Brooklyn – we knew we had arrived when we saw the sea of excessively bearded men and checked duffel shirts. It’s a great place to just mosey around and has plenty of trendy bars, restaurants and quirky shops, including a big junk store and an indoor market. 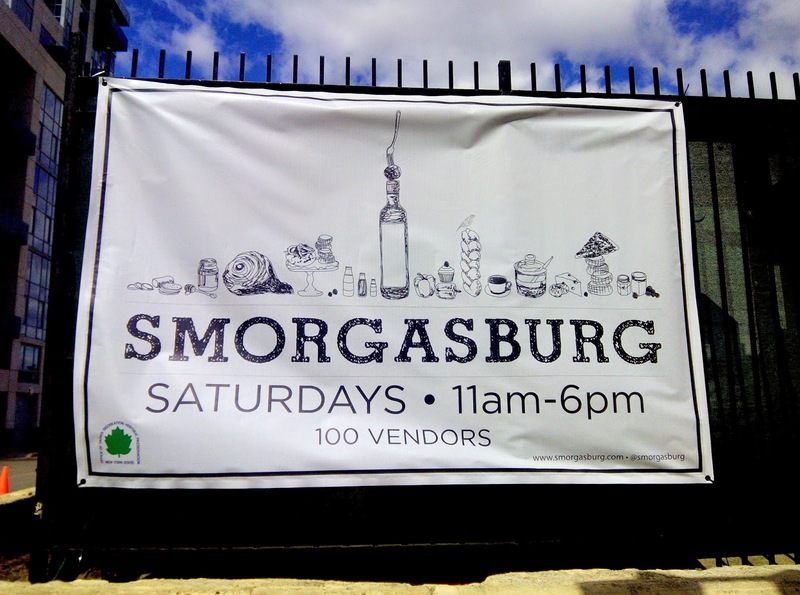 We ended up in Williamsburg on a Saturday, in search of Smorgasburg food market, which is described as an ‘outdoor flea food market’ with 100 vendors. There was an immense array of food on offer – brilliant fusion foods such as Asian hot dogs, Mexican-Japanese, along with some innovative veggie foods, including a whole stand devoted to beetroot burgers. There are lots of Dominicans and Puerto Ricans in NYC and I’d been keen to sample some of their typical dishes since our arrival. 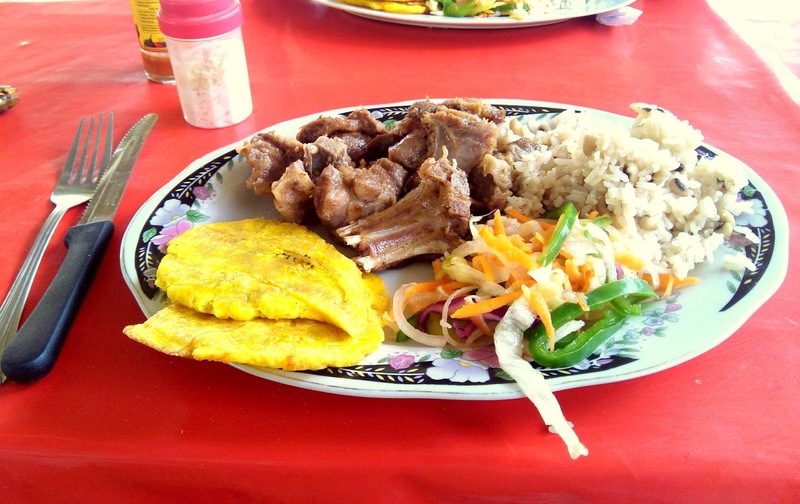 Although a lot of it is pretty similar to Colombian food, both these cuisines make mofongo – mashed green plantain which can be filled with vegetables, meat or fish. Mofon-go was one of the stalls in the market and their menu was simple – mofongo (surprisingly), filled with either chicken or vegetables. I went for the chicken, which came with chicharrón (fried pork crisps) and a wonderful tomato sauce, filled with olives and oodles of flavor. My lovely mother decided she wanted something meatier (because clearly the combo of chicken and fried pork didn’t do it for her – easy to see where I get my carnivorous side from). She opted for a burger from a rock-themed burger stall and went for the “balls to the wall” lamb burger with a harissa-tahini dressing. Once the guy on the stall and I could get over my mother asking for “balls to the wall” in her politest voice, her burger was served – a really tasty lamb patty, served with a side of chickpea salad. 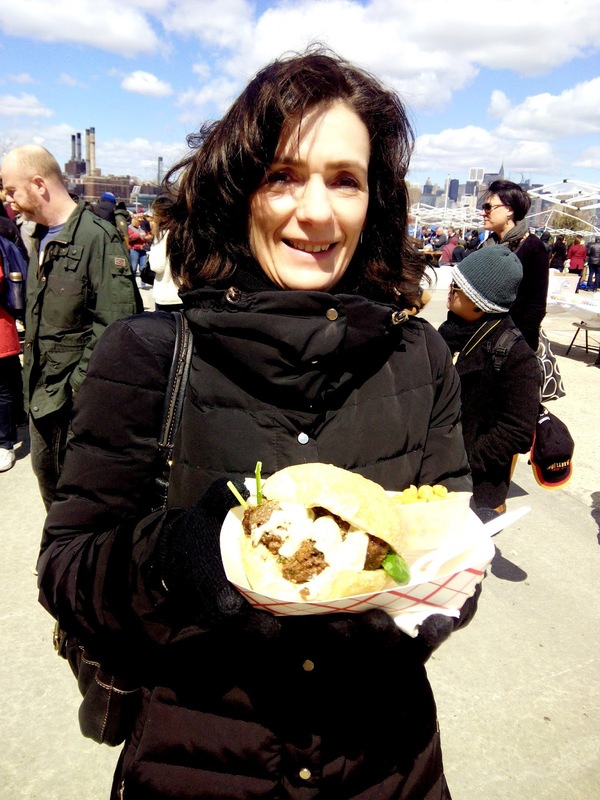 Smorgasburg is a great show of just how foodie New York really is, and I only wish I had the gift of never being full to allow myself to try a bit of everything! We left Brooklyn but were keen to return – given the fact it such a huge borough in the city, we knew there was more to be explored. Crown Heights is in the middle of Brooklyn, and I came to read about it doing some foodie research on NYC eats. 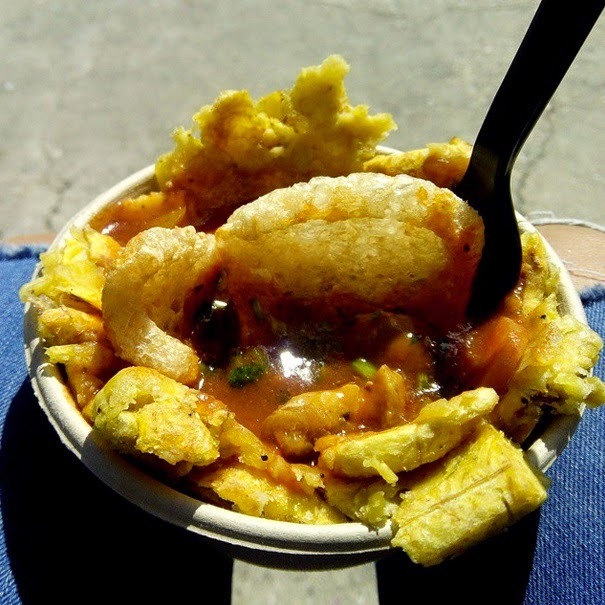 Crown Heights has a majority West Indian and African American population, and I was drawn to the area in search of what Serious Eats claims to be some of the best Trinidadian food in the city. 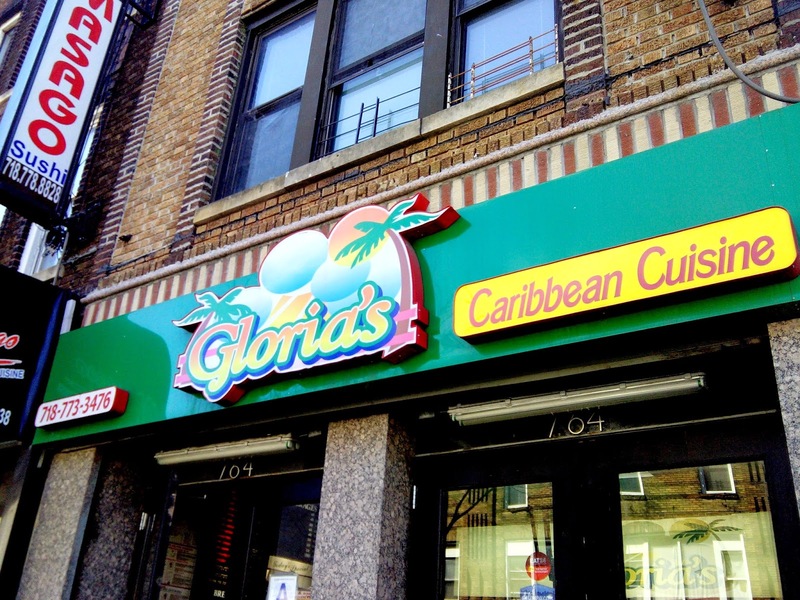 Gloria’s seems to be somewhat of an institution in the area, so much so that there is the original Gloria’s which we headed too, and a “Gloria’s Next Generation” which is just down the road. Serving up Trini classics such as goat curry and stew oxtail, my mum, my sister and I sat down for what turned out to be some exceptionally tasty food. My sister (the fish-eating vegetarian) opted for one of their famous filled rotis. Trinidadian roti is much like that found in Indian cooking and is a great accompaniment to a meal – it can be served torn up (called buss-up shot) or used as a wrap. While she enjoyed her curried shrimp roti roll, me and my mum got stuck into the ‘dinner’ options, which came as a main dish with rice and two sides. My mum went for stew chicken, which is cooked in spices and brown sugar, giving it a delicious, caramelized taste. Her sides were callalo (served up almost liked creamed spinach) and pumpkin. 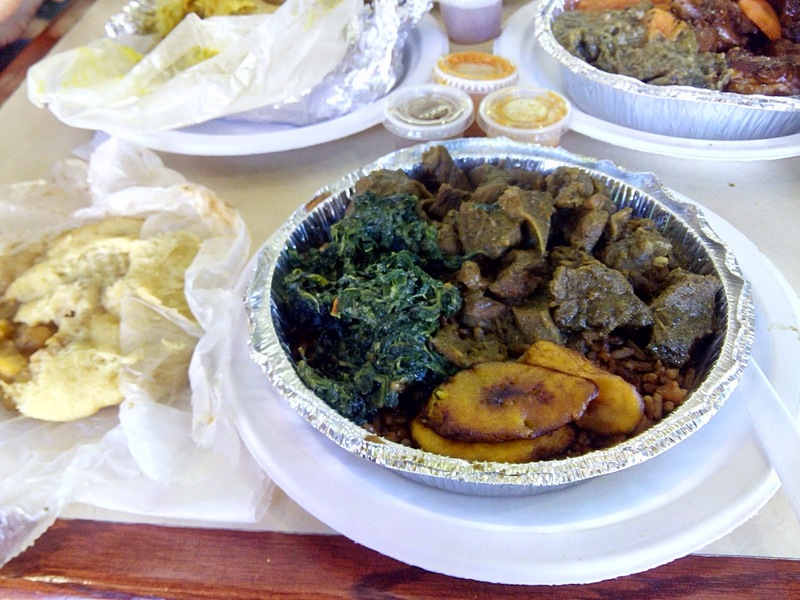 I enjoyed my favorite choice of curry goat with fried plantain and baghee (which is also a lot like spinach). My curry goat was rich and delicious, with all the perfectly cooked, tender meat slipping beautifully away from the bone. I opted for an extra double on the side, which is a typical Trinidadian fried bread (known as bara) filled with sauteed chickpea (called channa) and onion. Often eaten alone as a snack, I really enjoyed this tasty addition to my meal, which was particularly yummy dipped into the curry. Overall, a brilliant lunch, and bloody good value too! All that food with soft drinks came to a grand total of $38 dollars. 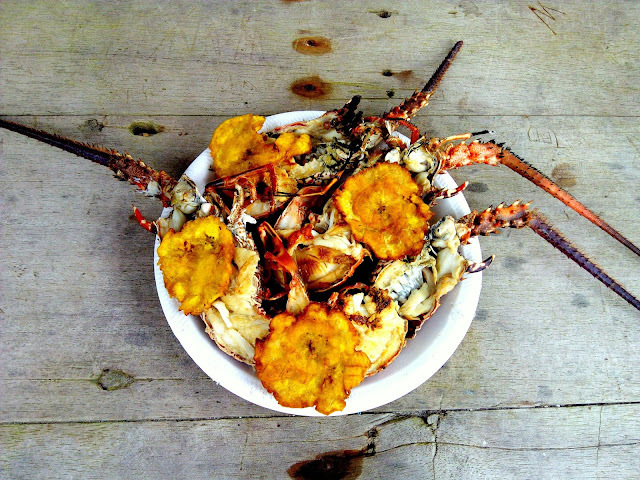 Highly recommended and worth veering slightly off course for a taste of these Trini delights. Williamsburg and Crown Heights are two very different Brooklyn boroughs, but very good examples of how much Brooklyn has to offer. If you are visiting NYC, you definitely need to head out of Manhattan and check out the many things happening across the Brooklyn Bridge. Stay tuned for the next New York City post, which sees me back at another Manhattan classic, Katz Deli. Pastrami sandwiches here I come! The New York City Highline is a 1.45-mile-long park built in Manhattan along a disused New York Central Railroad. The Highline runs through some very cool parts of Manhattan, such as the Meatpacking district, famous for its nightlife, and also Chelsea, home to a lot of the cities art galleries. Getting off the Highline in Chelsea we sought out Chelsea Market , a huge indoor food hall with more than thirty-five stalls, with cuisines and dishes from all over the globe. Spice stalls, a shop devoted to brownies, wonderful cafes, bakeries, fresh fish markets…there was something for everyone, and really far too much choice! We stopped in for a quick brunch, and then headed off to explore the rest of the city. Moving away from Chelsea, we headed into the equally cool Soho. A fashion haven that houses all the major brands, high-street and designer, it is also the location of the Chobani Yogurt shop. Chobani is a Greek yogurt brand, of which I am a huge fan. Like all Greek yogurts, they’re a great source of protein and I particularly like Chobani products as they aren’t at all artificial tasting or overly sweet. In fact, all sweetness from their products is naturally occurring due to sugars from milk, fruit, honey and evaporated cane juice. They have a great company ethos in relation to locally sourced produce – so much so that the New York based company withdrew from the UK market until they could make their products within the United Kingdom. A very sad day for this Chobani enthusiast! But a great step towards avoiding air pollution – you see, what a great yogurt brand. The shop itself is a really cool concept. 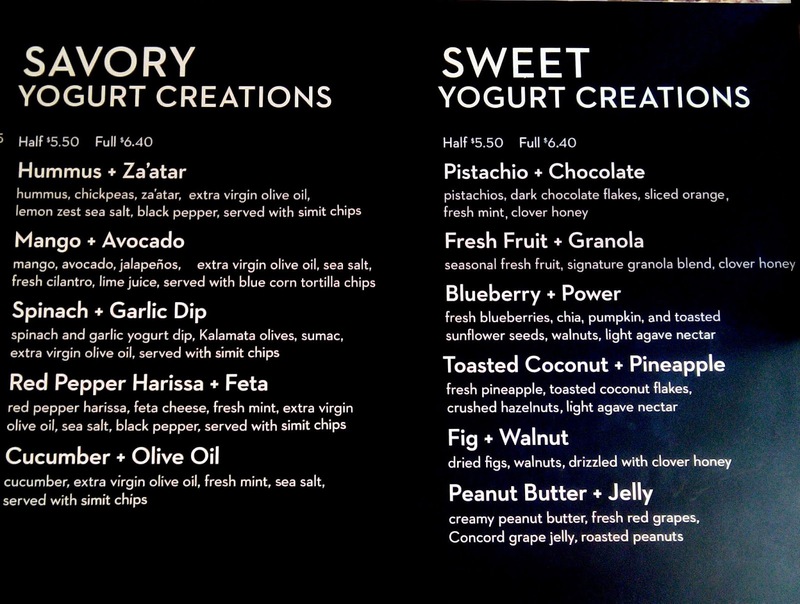 Aside from yogurt it also offers sandwiches, bagels and coffee, but the yogurt is kind of the star of the show. Plain Greek yogurt comes with either savory or sweet toppings. I went for the Blueberry + Power option, which had blueberries, chia, sunflower and pumpkin seeds, walnuts and agave syrup. I was a great combination of flavors and textures, and all the toppings on the menu gave me inspiration for great snacks to be made at home. You’ll never want to eat plain yogurt again! 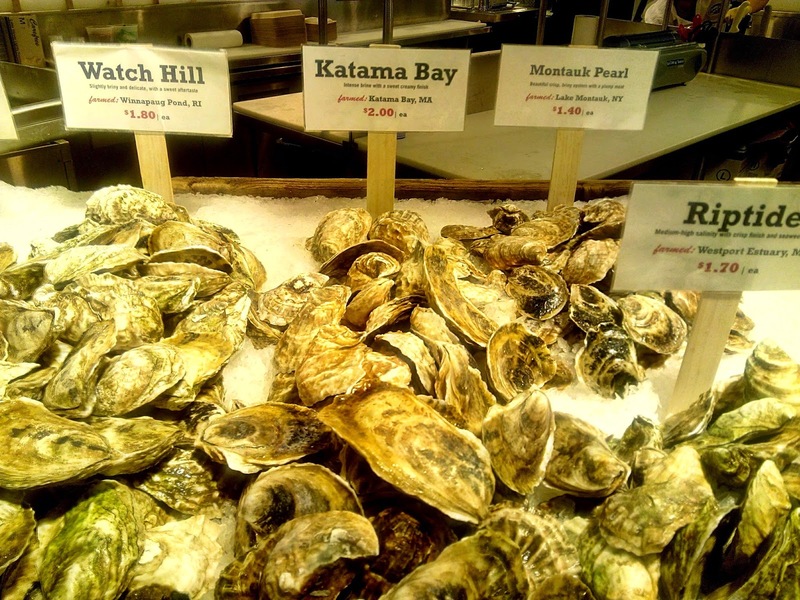 I really enjoyed strolling through Chelsea Market, and it made me think a lot of Borough market back home in London. The Chobani store was a treat for such an avid Chobani fan like myself, and I think the whole idea of a yogurt bar is awesome – clearly I’m not alone, as Chobani is the number 1 yogurt brand in all of the US! With more of the city to see, I was still hungry. 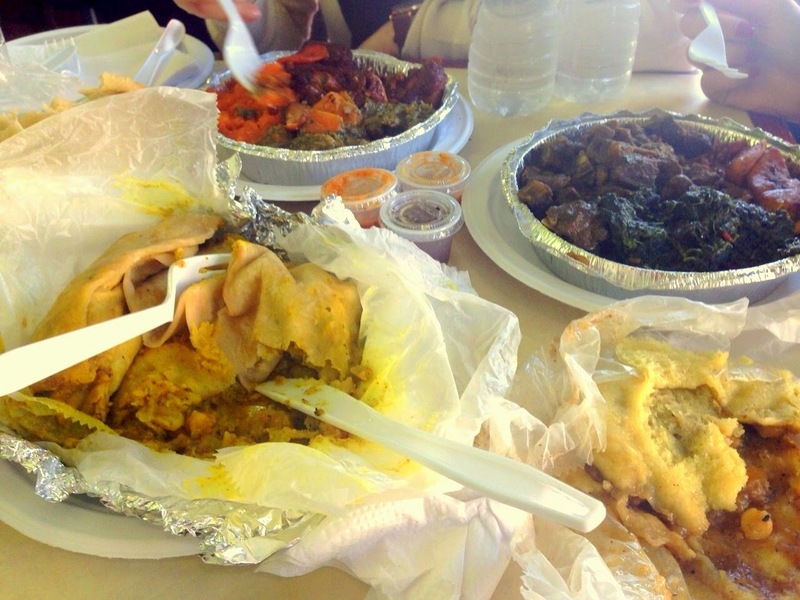 Stay tuned as we move into Brooklyn, in search of the best Trinidadian food the city has to offer. I just got back from the most wonderful holiday. Over the Easter break, the Bidmead girls (myself, my mum and my sister) were drawn to the city the never sleeps for a weeks stay. We explored New York to our heart’s content, visiting the many fascinating things the city has to offer, as well as catching up with my mum’s childhood friend and her two daughters who live there. It goes without saying that eating an immense amount of delicious, incredible and exciting food formed a large part of our time spent in the big apple too! Big yellow taxi in the back, pretzels to my rights…I’ve landed in NYC! 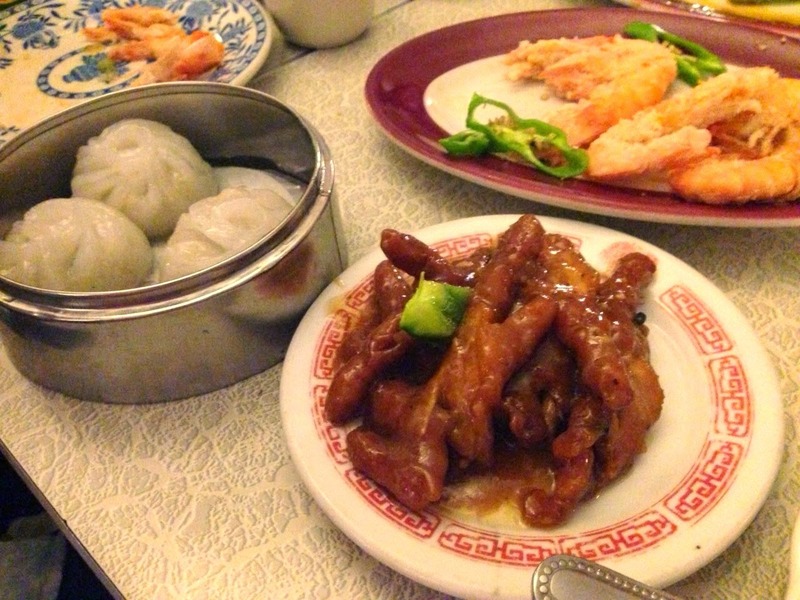 There is no way I could squeeze all the food NY has to offer into one post (let alone my jeans. Yes, I am returning from this holiday slightly larger than I arrived – but that, my friends, is the sign of a holiday well spent). So, here is the first of a few posts on my trip to the Big Apple. For our first night eating out in the States, we thought we’d do it in traditional, southern-style. 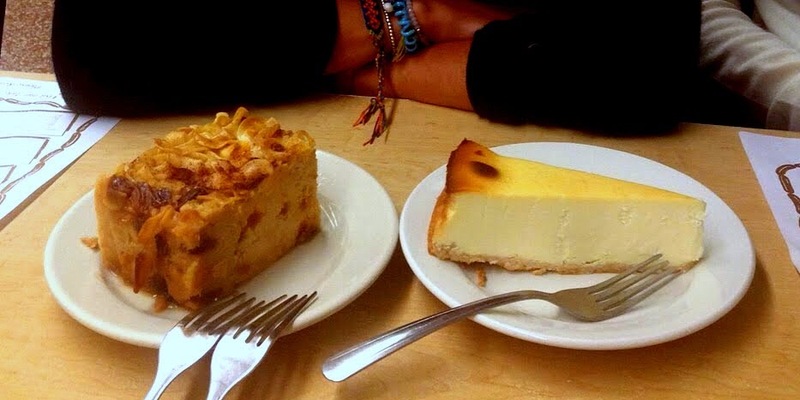 We hit up Miss Maude’s Spoonbread Too in Harlem, which serves American soul food. Think fried chicken, mac ‘n’ cheese, cornbread, candied yams… it’s hardly healthy, but then who on earth goes on holiday to eat healthy food? 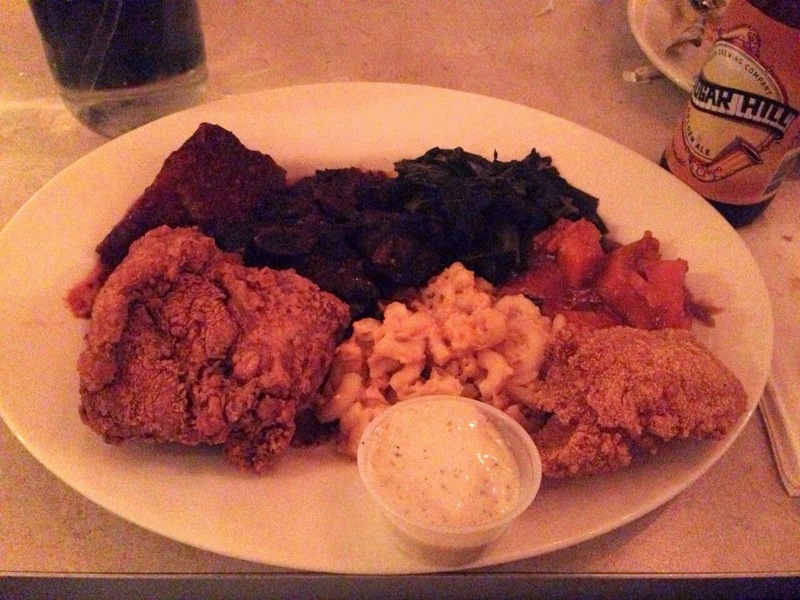 The Sampler- fried chicken, ribs, mac and cheese, collard greens, candied yams, fried shrimp and tartar sauce. I apologise for the bad quality photos! I aim to improve them with a better camera in time. I went for the Miss Maude’s Sampler, described as “A smorgasbord of Southern delights, including shrimp, ribs, chicken and vegetables”. It came with collard greens (basically cooked chard), candied yams and mac and cheese. I loved the sweet, cinnamon-y yams with the rich, dark meat, and really enjoyed being able to sample a little bit of each classic dish. 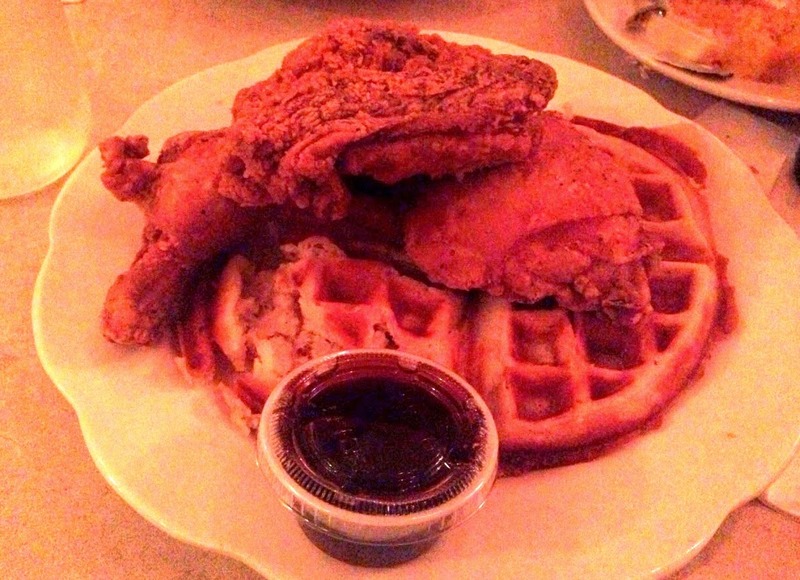 I was pleased when our friend Emma ordered the Chicken and Waffles as I’d always wanted to try this, but feared it might not be actually something I really liked. And it turns out I was right. Waffles? Yes. Fried chicken? Absabloodylutely. Put together? Not so much. Next time I’ll stick to chicken for my main and waffles for my dessert. Do you know what smothered chicken is? Perhaps you’d guess it’s chicken covered in some kind of sauce. Well…make that sauce gravy, and try deep frying that chicken first. I didn’t get any of this in my sampler platter, but my mum’s friend Jess ordered a plate, meaning I got to try it. 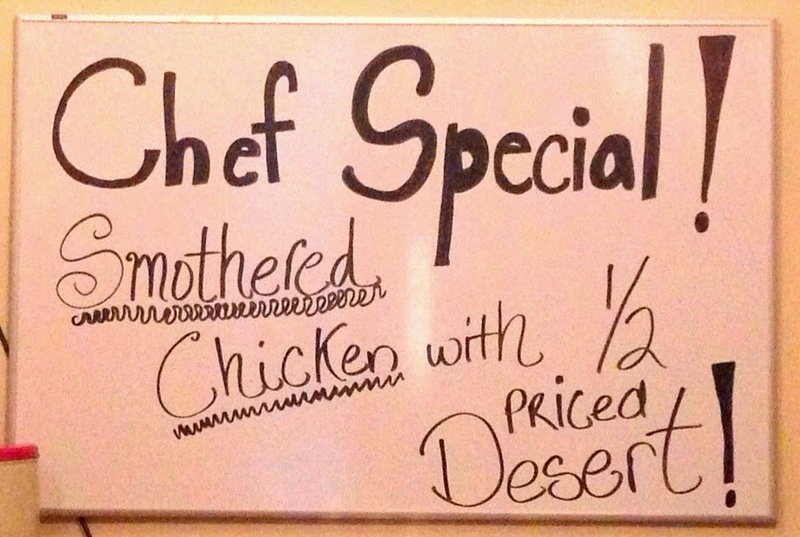 In case these mammoth portions aren’t filling you up…try a half price dessert on top of your smothered chicken! Think of all the flavor of fried chicken, with it’s soft tender meat and addictively crispy skin, topped off with spoonfuls of salty, meaty gravy – quite the combination. You may be surprised (and impressed) to learn we even managed dessert. We shared a peach cobbler, which is some kind of mix between a pie and a crumble, and a slice of red velvet cake. Both were exceptionally good and I particularly liked the cobbler, with its sweet stewed fruit on the bottom and cakey-buttery crust on top. I always argue that even if you are full from your main, desert is a whole different compartment of the stomach waiting to be fed. It would appear my dinner companions agreed, as we managed to finish both the deserts! 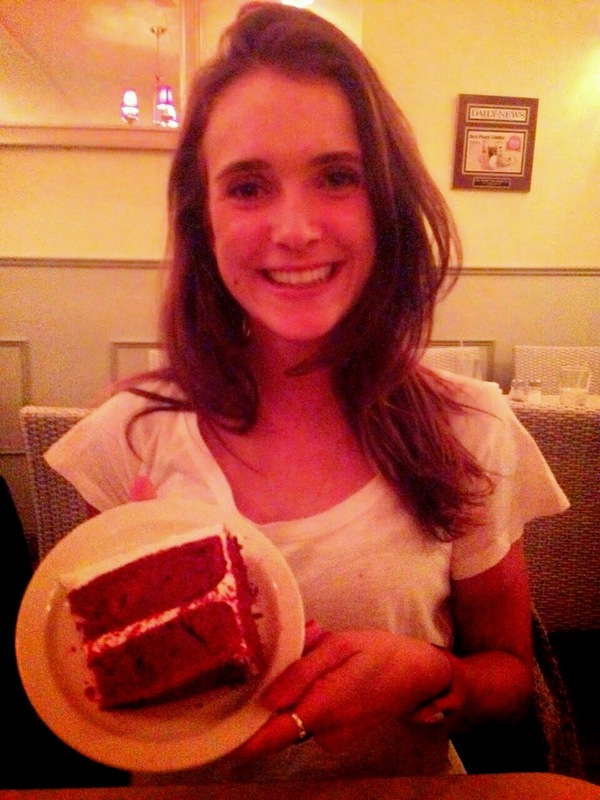 Red velvet slice, approximately 2/3rds the size of my head. 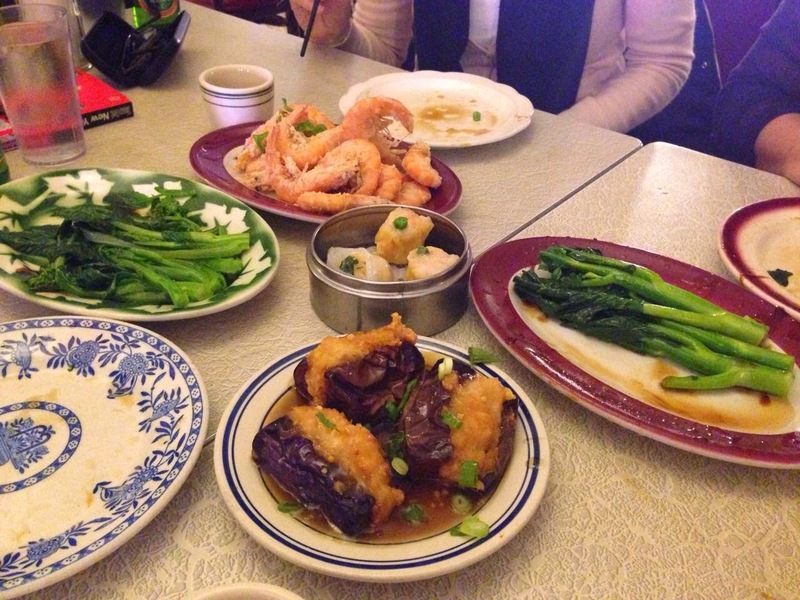 This meal was a hit with everybody, and also very good value considering all the food we managed to consume. I could only imagine what other foodie delights were in store…this truly was only the beginning! 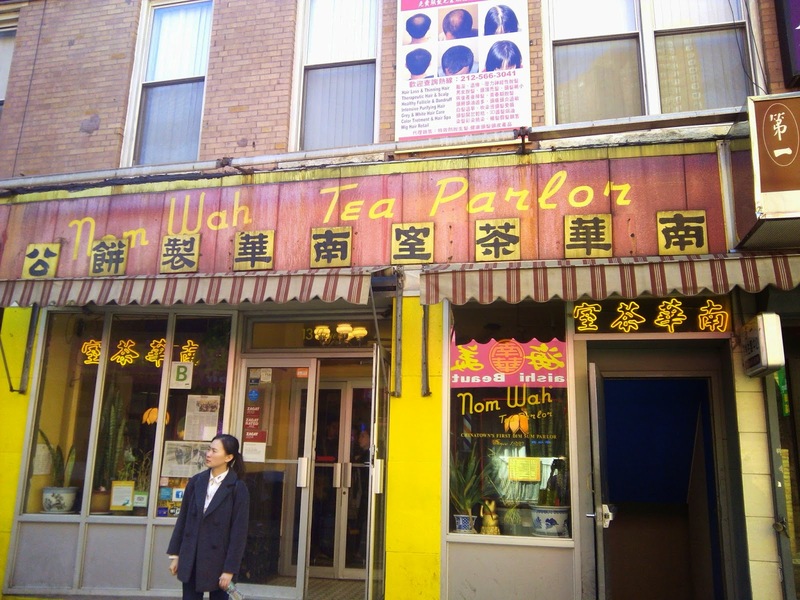 Stay posted for some classic New York deli food, dim sum at Chinatown’s oldest restaurant, food markets and Trinidadian food in Brooklyn, and a very non-traditional Passover dinner.